Zachary Edward "e;Zack"e; Snyder (born March 1, 1966) is an American film director, film producer, and screenwriter, best known for action/science fiction films. After making his feature film debut with the 2004 remake Dawn of the Dead, he gained wide recognition with the 2007 box office hit 300, adapted from writer-artist Frank Miller's Dark Horse Comics miniseries of the same name, and l… ater went on to direct the 2009 superhero film Watchmen, an adaptation of the comic book of the same name. He is the co-founder of Cruel and Unusual Films, a production company he established in 2004, alongside his wife Deborah Snyder and producing partner Wesley Coller. His first family film was the 2010 animated family adventure film Legend of the Guardians: The Owls of Ga'Hoole, based on the first three books of the series by Kathryn Lasky. His most recent film is Sucker Punch, which he directed and co-wrote. He has also been hired by Warner Bros. to direct a reboot of the Superman film series titled Man of Steel. This book is your ultimate resource for Zack Snyder. Here you will find the most up-to-date information, photos, and much more. 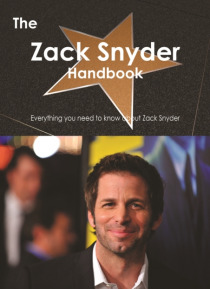 In easy to read chapters, with extensive references and links to get you to know all there is to know about Zack Snyder's Early life, Career and Personal life right away. A quick look inside: Zack Snyder, 300: Rise of an Empire, 300 (film), Abbie Cornish, Carla Gugino, Christopher Nolan, Cruel and Unusual Films, Dawn of the Dead (2004 film), Deborah Snyder, Green Bay, Wisconsin, Heavy Metal (film), Henry Cavill, Larry Fong, Legend of the Guardians: The Owls of Ga'Hoole, Man of Steel (film), Saturn Award for Best Director, Seven Samurai, Stephen McHattie, Sucker Punch (film), Superman in film, Watchmen, Watchmen (film) 170and more pages!Contains selected content from the highest rated entries, typeset, printed and shipped, combining the advantages of up-to-date and in-depth knowledge with the convenience of printed books. A portion of the proceeds of each book will be donated to the Wikimedia Foundation to support their mission.